Thakkali dosai is an easy breakfast fix, that you can make with simple ingredients at home. I came to know that this variety of dosa can be made through one of my roommates Usharani, during my hostel days. I tasted the dosa and it was very similar to the dosa my mom makes just by grinding rice and fermenting it for the next day. And this dosa need not be fermented as tomato is there for tanginess! We all love this,family favourite. Sorry I could not click stepwise this time. Soak rice for minimum 3 hours. Grind it in mixer or grinder along with tomato,redchilli. Heat tawa and add 2 tsp oil,temper with mustard,urad dal,curry leaves,asafoetida and then fry onion till just transparent and add it to the batter. I usually do this with coconut oil as it adds a great flavour. Pour in the heated tawa with drizzle of oil,cook on both sides. Serve with coconut chutney. Do not ferment overnight or more than 3 hrs as it will make the dosa stick to pan. Do not add tomatoes than mentioned as it will make the dosa sticky as well. i tried this once…loved it..looks yumm..
Wowo anothere variety of dosa i have never had looks so so yumm. 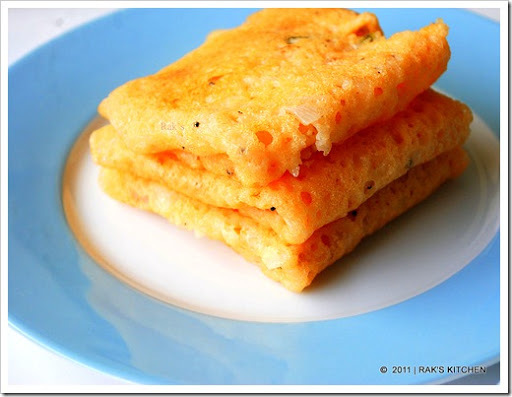 I havent tasted tomato dosa….very tempting they look…nice bright clicks! very nice colour to the dosa! wow!nice red colour dosa…surely kids will like it…nice click and presentation! Naalaikku morning breakfast ithuthan, thanks Raji…. Wow Raji, loved your pics and the recipe. Will try this sure. Thanks for stopping by my blog Raks. bookmarking this recipe….looks so beautiful n colourful with tempting clicks…. Yummy dosa.. and beautiful clicks..
Dosa looks so tasty and colorful. Wonderfully prepared. WOW so innovative.. such a nice idea.. bookmarked along with many of your other wonderful recipes. Nice thakkali dosa love the new version to sada dosa. I love this tangy dosa too and my mom used to make this pretty often. Love this dosa…..Loved the blue props..
Lovely click! My MIL makes this yummy dish! Diff dosa..will try it soon.. am loaded with more tomatoes in my fridge..
எனக்கு மிகவும் பிடித்த புளிப்பு சுவையுடன் கூடிய தோசை….அருமையாக இருக்கு…அழகாக சதுர வடிவில் எப்படி தோசையினை மடித்திங்க…அழகு,..
Love how lacy and colorful the dosa looks. Man the color looks fabulous! This weekend I am replicating your recipes. I will tell you how it turned out. Lovely dosaa…cute one and beautiful pictures. Romba superaa irruku Raji, tomato dosa with molagai podi appada nenachale pasikuthu..
oh! Raji I have one in my draft!, My click isn't as good as yours, will post it soon!, yours look beautiful! I keep making this whenever I have loads of Tomatoes. This sounds so simple and looks absolutely delicious. yummy yummy dosas Raji…wonderful breakfast! One more new south indian recipe @ ur space, i love to know different versions of this cuisine from you. Bookmarked ! My sister used to make this with the tempering -onion -green chillies. Colourful and tasty Dosa! Never had this before,luks very nice…will try. New to me. Must try them out. This one's totally up my alley – I indulge in the veggie/fruit infusion a lot – bookmarking! wow, that is so new and interesting, love the idea of adding tomatoes in dosa itself. Thank you for the recipe! This recipe is totally new to me and I tried it out today. The dosa was very tasty! I added some green chillies and cilantro too to the dosa. I love that it is almost instant and I don't need to wait and ferment it! Looks soo good…love the color!!Yummy!! அந்த ப்ளேட்ல உள்ள நீல கலர் & வெள்ளை கலர் சேர்ந்து அந்த கண்ணாடில ஒரு அழகான டிசைனா வந்து மார்டன் ஆர்ட் மாதிரி இருக்குப்பா!!.. :) சூப்பர்!! Lovely twist to the regular dosa!! great job raks…will try this yaar.. I know you just LOVE dosas…nice variety here!!! !Love the light red colour of the dosas. I love tomatoes and dosas so its bringing what you love together in one dish!! Awesome looking tomato dosas, i am always in for variety dosas…Cute clicks raks..
My son loves this and i make it at least twice a month. very yum recipe and clicks.Would really help me if you could share with me some tips on photography.What kind of lighting do you use? What alternative can I use instead of Idly Rice? Thank you!! 🙂 I'd also like the recipe for Dosa Batter. Can you send it to me? I tried this recipe and it was extremely easy to prepare. Very tasty and healthy too. Have mentioned it on my blog, trust its fine. Thank you for the recipe,tried it today for breakfast it was awesome. Hi Raks…Can the leftover batter be stored in the refrigerator? If yes for how many days can I keep it? Can the batter be used immediately to make dosas or should it be left to ferment? Pl answer both queries. Yes sure you can store it in fridge and also make immediately. I havenot tried making immediately, but I think there should not be any problem. But fermentaion makes it tastier and gives porous texture. Thanks for replying….for how long shud it be left to ferment? can u plz tell me what is idli rice? It is a variety of parboiled rice which we use specially for making idlies. Available in south Indian stores. can we use raw rice instead of idli rice? Really yummy…. Mu hubby and luv it…. Yes you can use, softness differs and chances are there to get dry dosa. Cook covered until you flip. Hi Rak tomato dosa looks wonderful and one doubt whether this dosa can be made with already grinded batter just by grinding tomato with that batter? Not able to spread dosa evenly on tava, breaks easily upon turning. Followed all your instructions. Help please. Should batter be thick? Hey, you have to make it like rava dosa, that is pour the watery batter around in the hot tawa, not pour like idli dosa batter.